John Zorn is a special character : the many faces of modern jazz. 1. A saxophonist : technically adept, yet I don't like his tone (often too cold : it's bizarre how he and Dave Douglas have this cold tone in Masada, while Greg Cohen (bass) and Joey Baron (drums) offer a warm sound. 2. A jazz composer : he is very strong in offering a mix of jazz with other influences, but especially klezmer. His best CDs are the Masada Live albums (Middelheim, Sevilla), but also his Bar Kokhba and his String Quartet releases are superb! 3. A soundtrack composer : he composes a soundtrack in a few hours (or so he writes in the liner notes for one of his Filmworks series (which one?). Nice music to listen to once (allright, twice). 4. A music publisher/producer : Tzadik, his label brings primarily klezmer-jazz and klezmer-rock, and new music. It's great how he offers young artists the opportunity to bring their music on CD, yet it has to fit within his vision. 5. A commercial genius : he managed to turn some unsellable music into a "branded" item. At the European Fnac stores, his label gets even a special section within the jazz department. 6. A wild improvisor : especially for his power and energy. 8. An avant-gardist : makes musical collages, tries out new things, not always with success, or at least not really my cup of tea (Spillane, Kristallnacht). 9. An everything-I-do-must-find-its-way-to-the-market : more than 100 albums under his own name in a timespan of 25 years, and the last few years on average 6 to 7 CDs per year! Zappa didn't manage to select his good from his trivial things too. So? 10. A romantic : why else would he advertise his jewish heritage in such a way, why would he be so terribly sentimental at times? In sum, a guy with a very open spirit and a broad musical knowledge, but it would be better for him (and for my wallet!) to be a little bit more selective in what he publishes, preferably with a greater sense of self-criticism. I find him fantastic. I find him awfull. Listen and judge. I have over 30 albums by Zorn, and most are worthwhile checking out. I am sure I forgot plenty, but this is a great start, I would say. ***** is the absolute top, if you don't buy this album, you're crazy. These albums are good today, and still tomorrow. Top-10 material of the year. **** is what could belong to the top-100 of the year. Excellent with a limited time frame. *** is OK, well played, some creative ideas, but probably not consistently on the whole CD. ** is nice try, but next time better. * not worth listening to. So why do I give so many stars to all the albums in put in my reviews? Well, because I listen to far more CD's than I review. And I enjoy it to share what I like, rather than to give negative comments on the ones I don't like (except of course, if they're really bad, then I might enjoy commenting). Just like you would like to know what is worthwhile to listen to, rather than to have a list of albums to avoid. Myra Melford is a searching spirit. She has already tried many ways of expression, often very idiosyncratic, never chosing the easy road, without giving in to commercial expectations, yet always looking for new sounds, melodic and rhythmic innovation. This quest brought her to India for a year, where she learned to appreciate the harmonium, this quest brought her also to Arabic music and sufism. In her previous album "Where The Two Worlds Touch", these influences were already apparent, but in "The Image Of Your Body" she brings all this one step further. This is not world music, this is modern jazz that fully integrates the Indian and Arabic and rock music into her idiom, and make it quite essential, rather than using it to add some flavor, and what she brings to life a real thing of beauty. For this album she is accompanied by Cuong Vu on trumpet, Brandon Ross on electric guitar and banjo, Stomu Takeishi on bass guitar and Elliot Humberto Kavee on drums. Strangely enough, Vu and Ross never meet on this CD, yet their approach is highly similar. 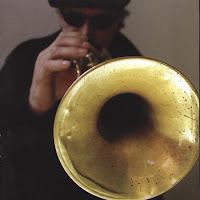 Vu is a master of the electronic distortion of his trumpet, as we know from his own albums, and Ross is a master in the same area, on the long piece "To The Roof" even sounding like Terje Rypdal. 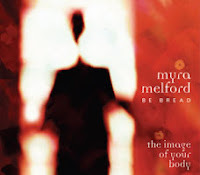 The title songs "The Image Of Your Body" and "Be Bread" have the most outspoken Arabic influence, with long unisono melodies of harmonium and banjo (replacing the Arabic oud for the occasion). Melford's presence is despite her technical skills very economical on this album, laying the harmonic foundations and adding accents for emphasis. She explains in her press kit : "I first played this music on the melodica and as a result, much of it is based on melody. It’s conceived as quartet music, but what’s important here is not the instrumentation but rather individual musical personality". But this shouldn't create the wrong expectations, this music is full of emotional power, full of suspense, menace, dispair, jubilation and chaos at moments, sentiments that are difficult to squeeze out of a melodica. This is tightly arranged, refreshing music with depth and variation. 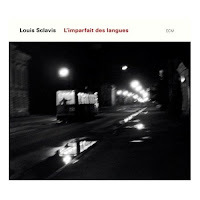 The music belongs to the same category of the album by Louis Sclavis that I reviewed yesterday. Both artists search for new forms of expressions, using influences from outside jazz and their end result is remarkably close. Louis Sclavis is a French clarinet virtuoso who has played with almost everyone of relevance in the European avant jazz scene in the past decades (Evan Parker, Brotzmann, Tony Oxley, Lol Coxhill, Henri Texier, Marc Ducret, Bruno Chevillon, ...). He has found his regular place with the ECM label for some time now. Much of his music is very complex, distant, cerebral, sometimes tending towards modern classical music, and hence not really my cup of tea. But the good news is that his albums with Aldo Romano and Henri Texier on the Carnets de Route trilogy (buy!) brought him back among the people, because this CD is warm, accessible (relatively speaking), and with lots of "Soul", something his previous albums lacked in my opinion. For this album he created a band with very young French musicians on sax, guitar, keyboards, bass and drums. The melodies are absolutely gorgeous, with influences from all around the globe, and like in many CDs by Henri Texier, French folk ingredients are omnipresent. But Sclavis brings this tradition a step further, past the deconstruction of free jazz, and reconstructs the melodies with electronics and rock elements. The fourth piece "Le Verbe" brings this whole transformation by itself. The title of the CD explains the philosophy : "l'imparfait" is at the same time the grammatical term for the past, but it also means "imperfect", such as languages and music, which continuously evolve, and hence impede the possibility to properly communicate, and yet despite these defects still make it possible to communicate, each in his own dialect or interpretation, to create a new language, one that is all-encompassing, one that is perfect. But that is my own personal vision of things, in retrospect. Whatever it is, the music is beautiful, moving, surprising, creative, intense, rocking, swinging, ... Sclavis re-invented himself ... and music history in the same effort. A gem! This music is a piece of genius. 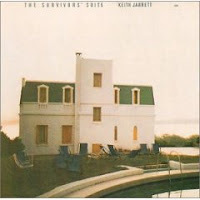 Even after having listened to it for a hundred times, The Survivors' Suite is still extremely exciting and moving. It starts out very slowly with a worldmusic sounding bass recorder and the lightly plucked bass of Charlie Haden, which move on into a hypnotic repetitive rhythm, the recorder like an incantation moving to the background, and then both saxes (Dewey Redman and Jarrett himself) play the core theme. It is almost magical how, with so very few notes, they can conjure up images of space, open skies, extensive plains, and it is only after approx. nine minutes that Jarrett takes place at his keyboard, repeating the theme in full force, while bass and drums intensify. This is not jazz in the traditional sense, this is music, full stop. Constructed with movements like in a classical symphony, but with room for improvisation. Jarrett's piano solo follows seamlessly, sometimes hesitant, then light and dancing. Paul Motian shows his extraordinary skills in giving accents to the music without playing a fixed rhythm, or rather giving the rhythm implicitly. Charlie Haden gets also some solo space, lightly supported by vibraphone (or glockenspiel?). Haden is a very lyrical improvisor, and he builds great tension into his solo by repeating the same sequence of notes and then gliding to the lowest sounds on his bass. Redman joins and soars as a bird over the melody, and when Jarrett plays his piano piece, Redman keeps blowing, softly, very softly in the background. Jarrett plays one of his most beautiful tunes, with all the romanticism and sensitivity for which he is known. 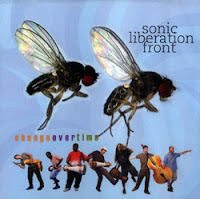 "Conclusion", the second piece (the B-side of the original album) starts with an intense, chaotic, free-for-all, with Redman screeching, Motian hard-hitting, Jarrett thundering, then suddenly moving on to an uptempo melody with an almost latin feel, with Haden on arco. The intensity remains for a long piece of improvisation, shifting back to the beginning melody, with the high tones of the bass recorder, the singing, howling sax, the plucking bass. The solo sax evolves toward the menacing chaos tones from the beginning, joined by the rest of the band and then suddenly the whole thing bursts open like a flower into a liberating open melody, with long and sustained tones of the sax and a playful piano. Everything quiets down then, with flute and bass, ebbing away... absolutely sublime! "And those that create out of the holocaust of their own inheritance anything more than a convenient self-made tomb shall be known as "Survivors". Ned Rothenberg is difficult to pigeonhole. He made some real avant-garde music, but also very accessible world jazz with his band Sync. While waiting for the band's latest album to be available in the European shops (just out on Tzadik in January of this year), I thought it would be wise to prepare readers to his former work. 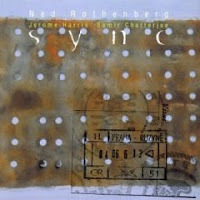 Sync consists of Rothenberg on sax and clarinet, Jerome Harris on guitar and bass, and Samir Chatterjee on tabla and percussion. Whatever the genre he takes on, Rothenberg is a phenomenal player, with a very broad range and an almost perfect mastery of the circular breathing technique, which allows him to extend melodies endlessly. The first piece "Gamalong" is an Indian melody, the second "Dag Can Dig" is a real jazz piece, with walking bass and bass clarinet, reminiscent of Audrey's dance in Twin Peaks, and on the third "Lost In A Blue Forest" he plays the Japanese shakuhachi flute. This CD touches upon many musical genres and the atmosphere often changes. The fourth piece starts in a Latin vein, and turns into Monk's Misterioso after some five minutes. The trio manages to weave all these musical influences into a coherent whole. In contrast to his more avant work in "The Fell Clutch" or "The Lumina Recordings" the Sync Trio is less focused on musical adventure, but more on the joy of making music and you can hear the musicians enjoy the interplay, giving assists to each other, and because of that the music is accessible, lightfooted, dancing, jubilating, ... a musical shot of adrenaline. 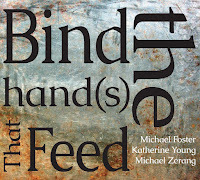 This one has just been released on both emusic.com and iTunes (surprise! ), and it is a real discovery. Three Polish musicians at the top of their skills. Adam Pieronczyk is a creative saxophonist with a very warm tone. The twin brothers Marcin (bass) and Bartlomiej (drums) are young and stellar musicians. I already knew Pieronczyk from his albums "Amusos" and "Plastinated Black Sheep" (both worth looking for), but this one is more intimate, and sad, sad, sad ... as the title already indicates. In terms of overall mood, Tomasz Stanko is never far away. 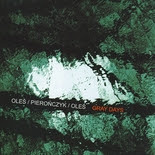 What's the matter with these Polish musicians to create all this melancholy? What is burdening their hearts to makes them sigh so deeply? Yet beautiful, melodic, open and free... What do you want more? This is another great album by British trumpeter Tom Arthurs, or rather by the trio with Bruce McKinnon on piano and Joe Sorbara on drums. The music on (by?) 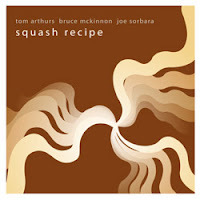 Squash Recipe is a delightful adventure into modern jazz or just music as such. Sometimes dancing, as in "Overwrought", with great interplay, sometimes brooding, as in "Touched", with contemplative piano and slow muted trumpet, sometimes playful, as in "The Floorboard Variations", sometimes fragile, as in "Banffalo", a very abstract improv, sometimes melodious, as in "Refractal", a beautiful minimalist repetitive piece, sometimes intense, as in "P2C2E", with odd rhythm changes, but on all pieces the musicianship is excellent, with three artists creating new sounds, and sound combinations on the spot, yet structured, with a clear common end-point. And that is probably the major achievement of the trio, that despite the broad pallette of musical exploration they bring, their vision is coherent and the album has a strong internal unity. This is an album to listen to very often, because each time you will find new nuances, new subtleties, ... in short : great. 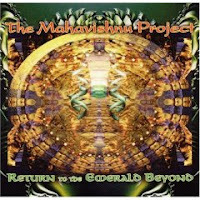 In my younger years (long ago), I was an absolute fan of John McLaughlin and the Mahavishnu Orchestra, and I was especially in awe of the technical skills of the musicians, the speed at which they played, etc. Visions of The Emerald Beyond was probably the band's last album I spent my money on, because I thought they had now completely moved into the realm of Kitsch, with a capital K. The music brought in funk in its ugliest form, vocals to run away from ("Earth Ship"), bird singing, Disney's mellowness, Motown, ... nevertheless, in retrospect, and when putting on this album by Greg Bendian's tribute band "The Mahavishnu Project", I remember the whole album by heart, so I must have played it more than I care to admit (especially "Be Happy" with the incredibly fast unisono theme by McLaughlin and Jean-Luc Ponty still makes me happy). This band consists of the a line-up mirroring the original band, with the only difference being the absence of a trumpet player (then Bob Knapp - I still have the vynyl album to check). The music sounds amazing after three decades : still kitsch, still requiring stellar musicians to play it. And their interpretation is excellent. They don't play it as a note-by-note rendition of the original, they use the material and play it their own way, thankfully a little more modern (yet hardly - long time ago since I heard a real synthesizer solo, plunging into the very depths of the machine!). This album does not have the pretence to bring anything new (and in any case less pretentious than the original). But it has the value of bringing something forgotten back to life (my youth, for starters). And how! This CD has just been issued, and it's already available on Emusic.com, and that's how it should be. 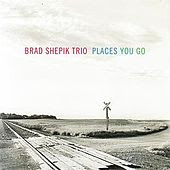 Brad Shepik is a technically very versatile guitar player with a broad musical background, from straight-ahead jazz, to more avant or balkan jazz oriented music, such as with The Paradox Trio and with Dave Douglas' Tiny Bell Trio. This CD is more on the same line as his previous mainstream jazz albums Drip and Short Trip, rather than his world music efforts on The Loan and The Well. Whatever he plays, Shepik is a very lyrical guitar player, building his solos strongly around melodic lines, rather than on harmonic progression, and he is not afraid of using odd meters. The major difference with the previous CDs is that the Hammond B-3 organ of Gary Versace has taken over the role of the bass, while Tom Rainey remains on the drums. This CD is somewhat quieter than the previous ones, with at times more American country music influences (and at times even Bill Frissell comes to mind), but Shepik keeps his own recognizable sound. Beautiful, for those who are not looking for musical adventures. 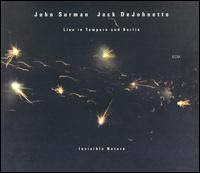 John Surman and Jack DeJohnette no longer need any introduction. The English sax player has carved out his own sound and melodic signature over the years, easy to recognize yet hard to emulate. The drummer is also a unique specimen, a rhythmic giant and a perfectionist of the sound quality of his instrument. 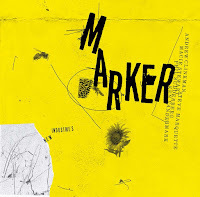 What these two virtuosi bring together on "Invisible Nature" is unique indeed : recorded at live performances in Tampere (Finland) and Berlin (Germany), this album is a joy from beginning to end, with no weak moments in it. The most amazing thing is that the whole album - with the exception of one piece - is pure improvisation. The music integrates many styles, electronics, the blues, Indian music, classical music, ... and jazz of course. The use of electronics adds to the variation of sounds on the album, yet the spontaneous compositions are by themselves strong enough to stand on their own and to bring a broad scale of variety. Highly recommended. These two musicians, Vijay Iyer on piano and Rudresh Mahanthappa on sax, seem to have been born for each other, and/or they have - after all these years of playing together - influenced each other to such an extent that they have created their own jazz sub-genre. 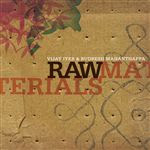 On "Raw Materials" they bring this interplay back to its bare essentials, without bass or drums. And these are not really lacking when you listen to them play. The keyboard touch of Iyer is percussive enough, but Mahanthappa's sax is also capable of supporting the rhythm while Iyer gives a solo. This is very intense music, with an incredible "drive", with a strong forward propulsion, splashing like a mountain river, thundering at times, with limited resting points. The rhythm can change various times within the same piece, and sometimes both players will accentuate different parts of the melody, resulting in their own kind of counter-rythm, until they fall back in a unisono melody. Both players are of the Karnataka region in southern India. Despite the inherent power in their play, they are at moments very lyrical and melodic, yet with a choice of notes which is often unusual, trying out new combinations, surprising and creative. Sometimes they give the impression of playing against each other ("I hear what you're doing, yet I'm still going in my direction") but then the whole thing comes togehter again. Beautiful. Emotional. Different. Recommended. 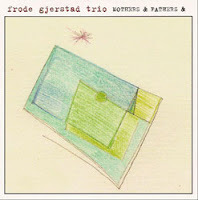 Frode Gjerstad is without a doubt the most important Norwegian free jazz musician. He is not a hardblower such as Peter Brötzmann with whom he performs regularly, but he's rather someone who's looking for subtleties of sound, seeking tonal modulation, in a more intimate manner, which often leads to a pointillistic filling of aural space. He is at his best in small duo or trio settings. And despite the small settings and despite the often lacking recognizable melody or rhythm, most of his albums offer a very exciting listening experience. This album "Mothers & Fathers" is not different in that respect. 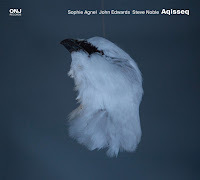 Despite his many CDs with American (William Parker, Hamid Drake, Bobby Bradford, Wilber Morris, Sabir Mateen, Pheeroan akLaff, Rachid Bakr, ...) and British players (John Stevens), he still made some with Norwegian musicians, yet they're a little harder to find. This is his fourth with Øyvind Storesund on bass and Paal Nilssen-Love on drums. The trio manages to create a very free and spacious environment, yet with a strong unity, focus and internal logic, with sufficient variation, changes of tempo and high energy. Great album. Recommended. The French RogueArt label has published a wonderful series of modern jazz in the past frew years, including work by Hamid Drake, Malachi Favors, Roscoe Mitchel. 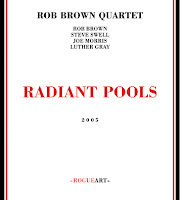 And also this "Radiant Pools" by Rob Brown (sax) with Steve Swell (trombone), Joe Morris (bass) and Luther Gray (drums). The first piece is uptempo, pushed forward by bass and drums, with excellent solos by Swell and Brown. 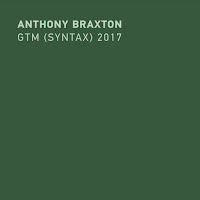 Then comes "Semantics 1", a more abstract and contemplative piece, with great interplay of Morris on arco, and with the sax and trombone that seek and elicit tones and sounds from eachother like a love dance between two doves. The same concept returns in "Semantics 2" later on the CD, with Morris on flute. "Out Of The Lurch" is more freebop, with a solidly anchored rhythm and a clearly delineated theme. "Radiant Pools" starts with a minute-long unisono of sax and trombone, moving away and coming back again. Halfway the piece, Morris's arco enters the game. The most beautiful piece is King Cobra, a composition by Joe Morris (also to be found on his "Beautiful Existence") which is slightly funky and because of the sheer beauty of the melody brings up the best out of the musicians. 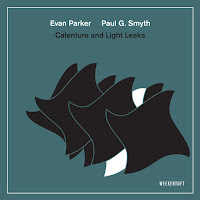 The overal space offered by the music on this album allows the musicians to demonstrate the breadth of their technical range and knowledge of jazz in all its aspects. Great. Jerry Gonzalez is probably best known for his Fort Apache Band, playing afrocuban jazz, but this album is something completely different. Intimate, contemplative, beautiful : a trio with trumpet, Spanish guitar and hand percussion. This is flamenco music with a jazzy tinge, or jazz (Monk, Charlie Parker) with a flamenco tinge. Singer Diego El Cigala joins on several pieces, adding his raw flamenco voice to the party and giving it some more Spanish ingredients. The music itself is far removed from the uptempo handclapping flamenco dance, but exists for its own sake, with slow, carefully crafted and distinct melodies, great compositional structures, offering space for improvisation. This is fragile, sensitive, respectful, authentic music, far removed from the kitsch of so much fusion. The percussion, the trumpet, the guitar, the voice : they fit perfectly. Ayler Records is a great label, which has released some excellent discs of free jazz in the past years, of which many were recorded at the Glenn Miller Café in Stockholm. 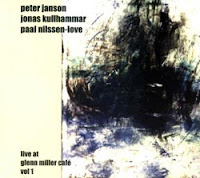 This one with Peter Janson on bass, Jonas Kullhammar on baritone sax and Paal Nilssen-Love on drums has recently been made available on Emusic.com. It is a live performance of free trio blowing. The main quality of the album is the sheer musical energy released by the trio, with kudos to the excellent drumwork of Nilssen-Love. Their creativity and musicianship is excellent, although I sometimes missed some focus, wondering where all this soloing was going to. Four percussionists, three horns, bass and guitar is a line-up which says it all. Rhythms galore! Especially afro-cuban rhythms, with vocals in the yoruba language from West-Africa in a few songs. The music is pleasant to the ear, the soloists are more than just good. The only downside is that we've kind of heard the same thing on their previous releases. Their first album "Water & Stones" is still their best. There isn't enough variety in the music to keep things interesting and the compositions are too flat to encourage repeated listenings. A little more adventure would have been welcome.